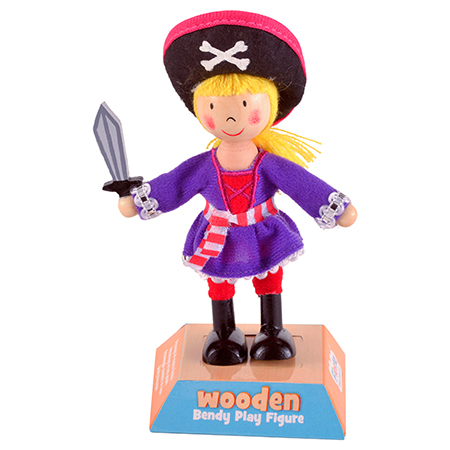 These play figures are exciting to look at with attractive colourful clothing. There was lots of acting and the children built some very good narratives (we loved the different voices they used! ), which is great for developing creativity, language and oral storytelling skills. They played with the figures alongside other similar toys, such as large castle, and we observed some really imaginative play. We were even lucky enough to see a puppet show put on by a group of six year-olds; they used the play figures alongside some traditional puppets. It was a great toy for encouraging collaborative play. Some of our younger testers found the limbs quite difficult to manipulate, but they may loosen through extended use. Play has become more exciting with our new Play Figures! With moveable bendy arms and legs that stay where you put them, these entertaining characters are completely poseable and ready to spring in to action for any adventure you can think of! These Play Figures are always dressed to impress with their bright fabric costumes, adorned with charming embroidered details, not to mention their beautifully crafted wooden heads and cute little faces! These play figures are exciting to look at with attractive colourful clothing. There was lots of acting and the children built some very good narratives (we loved the different voices they used! ), which is great for developing creativity, language and oral storytelling skills. It was a great toy for encouraging collaborative play.